NEW: U.S. says the attack is an "outrageous act of violence against innocent civilians"
China says the attack is "a serious violent terrorist incident"
Hong Kong (CNN) -- A series of explosions tore through an open-air market in the capital of the volatile western Chinese region of Xinjiang on Thursday, killing dozens of people and wounding many more, state media reported. 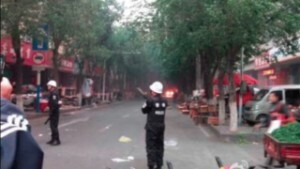 China's Ministry of Public Security said the attack in the heavily policed city of Urumqi was "a serious violent terrorist incident" and vowed to crack down on its perpetrators. President Xi Jinping called for the terrorists behind it to be "severely" punished. 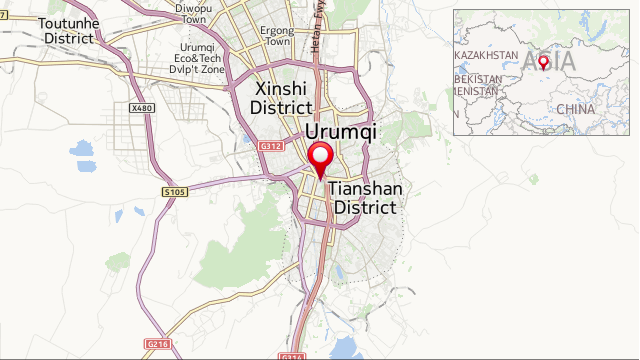 Two SUVs slammed into shoppers gathered at the market in Urumqi at 7:50 a.m. Thursday, and explosives were flung out of the vehicles, China's official news agency Xinhua said. The vehicles then exploded, according to Xinhua, which said at least 31 people were killed and more than 90 wounded. Some of the photos circulating on social media suggested a hellish scene, with bodies strewn on the ground amid burning wreckage. Others showed flames and smoke billowing out of the end of a tree-lined street guarded by police officers. "I heard an enormous sound, then I looked out from my balcony," said a resident of a building near the explosion who would only give his surname, Shan. He told CNN that trees obscured much of his view of the scene, but that he "could see there was chaos, with people injured." Many of the victims caught in the blasts were elderly people who regularly visited the morning market, Xinhua reported. "It's mainly people coming to trade vegetables, especially the elderly who get up early and buy vegetables to cook," Shan said. The U.S. government condemned the attack. "This is a despicable and outrageous act of violence against innocent civilians, and the United States resolutely opposes all forms of terrorism," White House Press Secretary Jay Carney said in a statement. Chinese authorities have stepped up security measures in Xinjiang in recent months amid a series of attacks within the region and in major Chinese cities outside it. On Wednesday, the day before the blasts, Xinhua reported that 39 people had been sentenced to prison in the past two months for "inciting violence" in Xinjiang. But the devastating blasts Thursday suggest the government is facing a foe determined to wreak havoc. Thursday's attack at the market comes less than a month after an explosion hit a train station in Urumqi, killing three people and wounding 79 others. That blast took place on April 30, just after Xi had wrapped up a visit to the region. They have also blamed separatists for an attack in Beijing's Tiananmen Square in October in which a car rammed into a pedestrian bridge and burst into flames, killing two tourists and the three occupants of the vehicle. Ethnic tensions between Uyghurs and Han Chinese people, millions of whom have migrated to resource-rich Xinjiang in recent decades, have repeatedly boiled over into deadly riots and clashes with authorities in recent years. Some Uyghurs have expressed resentment over harsh treatment from Chinese security forces and Han people taking the lion's share of economic opportunities in Xinjiang. The Han are the predominant ethnic group in China, making up more than 90% of the overall population. The pattern of ethnic violence in the region goes back decades, according to James Leibold, an expert in ethnic relations in China at La Trobe University in Melbourne. "But what's new, and what I think is significant, is that we have a shift in target," Leibold said. "We have a targeting of innocent civilians, places where innocent civilians gather -- an attempt to maim innocent civilians in large numbers." The other change is that the violence has "seeped outside" the borders of Xinjiang into other parts of China, he said. It remains unclear who exactly is behind the high-profile attacks in recent months. Chinese officials have pointed to a murky separatist group, the East Turkestan Islamic Movement (ETIM), which they have blamed for violent acts in the past. East Turkestan is the name used by many Uyghur groups to refer to Xinjiang. But analysts are divided about the extent of the ETIM's activities and its links to global terrorist networks like al Qaeda. "Generally, the government response is to blame terrorists without providing many details," Leibold said. "So I suspect it's going to be very difficult to get to the bottom of this incident like previous ones."